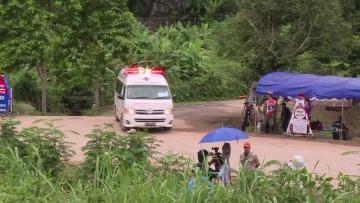 At 4.30pm, it was confirmed that the medic and the divers had also successfully emerged from the cave. A crack team of foreign divers and Thai Navy SEALS guided the boys out through nearly 4 km (2.5 miles) of sometimes submerged, pitch-dark channels. Among them is Mikko Paasi, a diving instructor from Finland who was in Malta when the children were discovered in the cave and immediately flew to Thailand - on his wedding anniversary - to join the rescue effort. He had previously lived in Thailand. Mr Paasi has since been into the cave several times and said on his facebook page this morning that conditions are still good He also uploaded pictures of his muddy diving suit and the divers working in cramped conditions.